Gather around, youngsters, as I craft you a tale of days of legend. Many, many eons ago – about 30 years, give or take – if an adventurer wandered into a hobby establishment, they might find strange and wondrous treasures locked inside small, plastic bags or unmarked cardboard receptacles. As it turns out, these treasures were board and card games from small, independent publishers, often printed on inexpensive stock, heavy in theme and playability, and low on cost. These small rebels were fighting against the giant mainstays – the Parker Brothers and Milton Bradley – and generating a gaming renaissance that paved the way for the myriad variety of games we find in our friendly local game stores today. 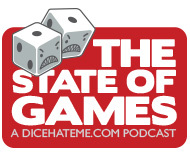 Every few years it seems that this trend re-emerges and some plucky independents crop up amidst the sea of flashy, big-box games. In the pioneering early-80s, it was Steve Jackson and his ziploc-bagged wonders. In the mid-90s, Cheapass Games reminded us that we could have hours of fun for about 5 bucks. Today, however, there is a new resource available to fledgling game designers and developers that could usher forth an even greater renaissance than before – print on demand. 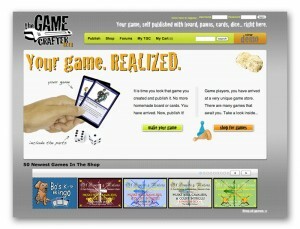 At the forefront of this developing resource is The Game Crafter. Based out of Madison, Wisconsin, The Game Crafter was formed in 2001 by JT Smith as a way to print and sell independent board and card games. In 2009, the company made its resources available to the general public and created a website that would allow anyone with an idea and the wherewithal the opportunity to see their creations in print. 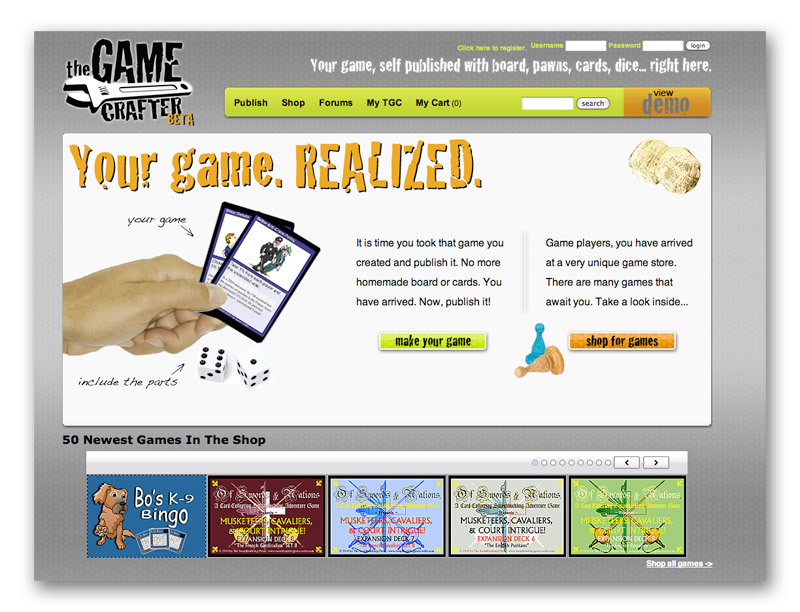 The Game Crafter website is both a game creator’s resource central and a store in which anyone can peruse and buy hundreds of games created by people with passion and an idea. For those that want to see their own game in print, The Game Crafter provides templates for uploading art and design specifications, as well as tips for how to produce a quality rule book, a talent database of other designers, artists, graphic designers and playtesters, and a pool of components from which to choose, such as pawns, dice, cards and such. Once all art and specs have been uploaded to the site and a selling price has been decided upon, the game is placed into The Game Crafter store in which any visitor to the site can purchase. The game is immediately printed and boxed together with the rulebook and components and shipped out to the purchaser. The benefit of this system is that there is no upfront cost for new game developers, and no warehouse full of pre-printed copies that must sell in order to make a profit. As swell as this system sounds, it’s not without its drawbacks. First, to keep costs and production time in check, The Game Crafter is unable to mount any prints onto cardboard, like traditional board games. The “boards” for any games are printed on thick stock – the same stock that they use to print and cut cards. Components are somewhat-limited, as well – no custom woodcuts or specially-printed dice, just a selection of stock plastic pawns and die available from online distributors. The Game Crafter does provide an alternative for customizable components, however – they have differently-colored round wood chips that can accommodate stickers with custom art. The stickers are very inexpensive, giving game designers with a little creativity a chance to play around with components without costing themselves and their customers an arm and a leg. In addition to the limits on printing resources, there is one other drawback: Right now, The Game Crafter store is filled with quite a bit of amateur endeavors. However, there are a few gems if you take the time to sift through the masses. Much like the internet, when you give a large group of people an opportunity to express themselves cheaply and openly, you’re going to have to spend some time separating the wingnuts from the visionaries. Luckily, The Game Crafter website does some of the work for you, and provides a feed of the most popular games. Aside from the opportunity for the general public to express themselves with games, The Game Crafter seems perfect for those game designers that would like to develop their properties into strong competitors in the marketplace, either through self-publishing or shopping to larger publishers like Z-Man or Fantasy Flight. The Game Crafter is a perfect resource for printing a few copies of a prototype to take to conventions, trade shows and to send to publishers. Inexpensive copies could also be ordered for playtest groups; the quality prints from The Game Crafter will beat those produced on a home printer any day. Regardless of how the resources of The Game Crafter are used, it’s a testament to the popularity and endurance of the boardgaming hobby that a company such as this can be viable, especially in this economic environment. As magnificent as those days of legend were 30 or so years ago, those of us who love this hobby are very lucky to be living at a time when anyone’s next great gaming idea can become a reality. For more information, please visit The Game Crafter website for game publishing resources and their store, full of fun, interesting products. Thank you for the great article on our service. Our staff members and community appreciate it when people spread the word! Something that isn’t widely known yet (but will soon be) is that a self-published game on The Game Crafter website won the “Traditional Game of the Year” Award from Games Magazine! This is a huge accomplishment for Matt Worden Games (www.mwgames.com) as well as the entire TGC community. It shows that even the ‘little guy’ can do big things through self-publishing a game. In addition, this awesome achievement should bring more attention and credibility to the TGC community and collection of self-published titles. Congrats to Matt Worden and his game Jump Gate! Hey, thanks for stopping by and spreading the good word! I saw the news about Matt and his game on Boardgame Geek recently, and was excited to see that it was published by you guys at The Game Crafter. That’s really awesome, and I’m glad independent designers are getting the chance to put their ideas out there because of resources like yours. I may be bringing some designs of my own your way next year – The Game Crafter seems like a great place for me to produce some prototypes! The quality of games are getting better and better at Gamecrafter! Just take a look at Wild Pursuit! There is a lot of talent to be found there at TGC and Nightstalker Games is trying to help shine a light on those hidden gems. It proves that you don’t have to go to the big corporations to find great games. More of these great games need to be brought to the community’s attention! Congratulations to Matt Worden and Jump Gate!